Pizza is an all inclusive food, right? Young, old, Sicilians, New Yorkers, Santa Fean or Californians, everyone loves to dive into a hot, cheesy slice of delicious pizza. 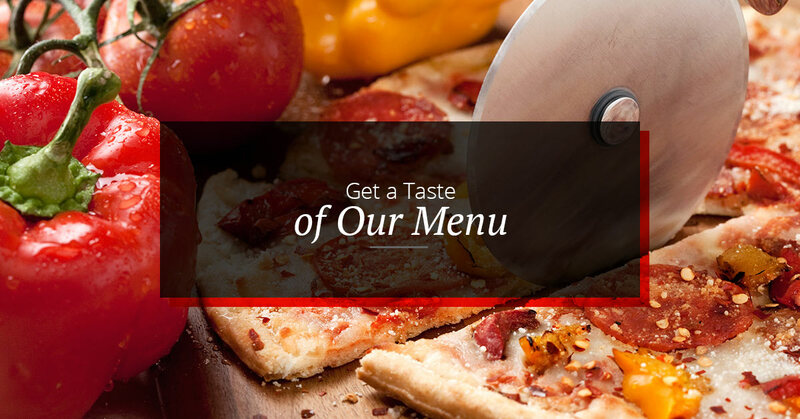 What our guests love at Upper Crust Pizza is our all-inclusive menu. We are a 100 percent judge-free zone, so if you want a plain cheese pizza, double sausage, or pineapple on your margarita, we will be more than happy to prepare the tastiest pizza you’ve ever had. Let’s take a tour of our menu so you can be fully prepared to order up exactly what you’re craving, or will be craving when you visit us tonight. So, if you can’t wait until Friday pizza-night to dig in, we have a breakfast menu just for you. Breakfast burritos are a great way to start the day off right. Choose our classic burrito or our black bean and cheese burritos with our famous Tortilla Flats salsa, and get all of the protein and energy you need for your day. From a comforting bagel and cream cheese to homemade quiche, Greek parfait, and locally made fresh pastries, you can be sure to eat like an Italian at Upper Crust Pizza for breakfast. Sandwiches, salads, and lunch specials at our Santa Fe location, you’ll never have to worry about being hungry at lunch time. 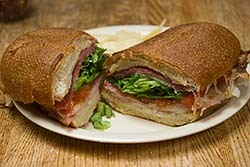 Choose between sourdough or whole wheat sub rolls and pile on all of the veggies and the best Genoa salami, chicken, ham, turkey, or meatballs. Topped with classic lettuce, tomato, onion, oil and vinegar, and finish it off with potato chips or a side salad and your co-workers will be jealous. We try to keep things healthy here, too. A salad for lunch or dinner is always a great choice when it includes fresh ingredients like bell peppers, kalamata olives, tomatoes, spinach, walnuts, pine nuts, and fresh smoked salmon. Keep it simple with a caesar salad with our own caesar dressing or try our perfectly balanced smoked salmon salad, you can enjoy a yummy meal and still indulge in a slice of pizza. Our Santa Fe famous pizza will surely leave you feeling satisfied and still wanting more. 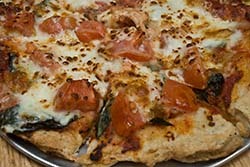 Choose a specialty Grecian Gourmet, Sunny Chicken Pesto, Margarita, or New Mex, one of our favorites, or build your own. Topping choices are endless at Upper Crust Pizza. All meat pizza, all veggie, or broccoli and chorizo with feta cheese, our chewy crust, seasoned sauce, and stringy cheese combine fresh flavors and a texture that is to die for. Want to fold up your pizza and make a calzone? Get more of amazing crust in a famous zone filled your favorite ingredients. We don’t want to leave out anyone at our restaurant. If you prefer a whole wheat crust or need a gluten-free crust, we have it all, so you can eat it all. Our gluten-free crust allows those with sensitive stomachs all over Santa Fe to come and enjoy some incredibly tasty pizza. Still get the flavor that you crave with the nutritional requirements you need. Whether you come in for breakfast, lunch, dinner, dine-in, or order pizza delivery, we can’t wait to serve our entire Santa Fe community.